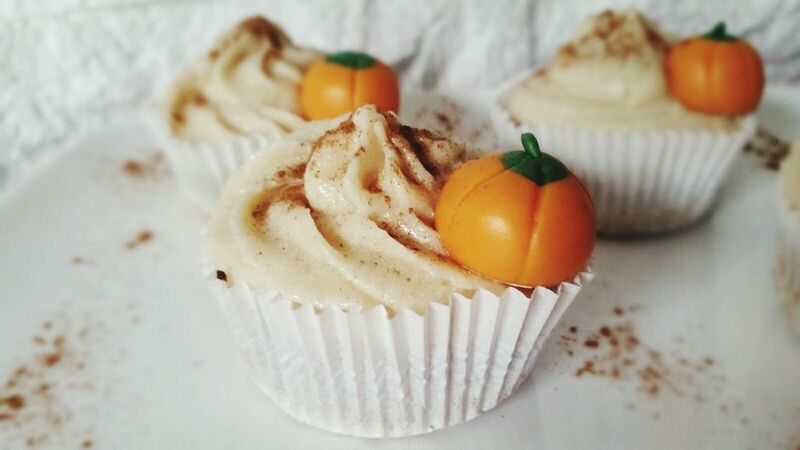 These are some of my absolute favorite vegan cupcakes--the pumpkin keeps them moist without making them dense, and the fall spices are always a treat. Preheat the oven to 350 F. Line a 12-cup muffin tin with paper liners and set aside. In a small cup, combine the almond milk (or soy milk) and vinegar. Allow the mixture to rest for 5 minutes. In a large mixing bowl, mix together the flour, baking powder, baking soda, sugars, cinnamon, ginger, nutmeg, and salt. Set aside. In another mixing bowl, mix together the pumpkin puree, canola oil, vanilla, and almond milk-vinegar mixture. Add the wet ingredients to the dry, mixing until just combined. Divide the batter into the cups, filling each liner about ¾ full. Bake for 16 to 20 minutes, or until a toothpick inserted in the center of a cupcake emerges clean. Allow cupcakes to cool completely before frosting with vegan cream cheese frosting.